This one story villa is perfectly balanced with central living spaces and bedrooms distributed for privacy and comfort. Eight bedrooms, nine bathrooms and a beautiful terrace. Great for groups of up to 20 people. Walking distance to the supermarket, marina restaurants, shops and cinema. Just a ten minute golf cart ride to Minitas Beach. Under an asymmetrical wood beamed ceiling, a combination of sofas and chairs, upholstered in ivory fabric, to create an ideal spot for socializing. Guests have a variety of outdoor options to bask in the sublime Caribbean lifestyle. The terrace, sprinkled with chaise lounges and umbrellas, stretches out toward the marina, while lush landscaping and tall palms create a tropical mood. In the center is a large Heated Pool with inviting crystalline waters for an invigorating swim or lazing on a float. 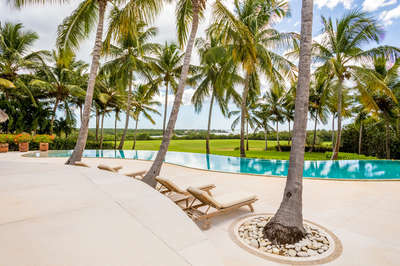 All guests renting private villas or apartments at Casa de Campo must register with the Villa Owners Club, and for a small daily fee, are granted full access to resort areas and amenities. Please note, villa owners’ family members and friends are not required to pay, but must still register with the office upon arrival. Once a request has been submitted we will respond within 12 to 24 hours. $25 per adult (age 15 or older). $12 per child (age 4 to 12). No charge for children under four. The registration fee must be paid prior to entering the property and can be paid at the Villa Owners Club office located in the main resort area. The office is open daily from 8:30 AM to 10:00 PM (extended hours possible with 24-hours advance notice). This beautiful villa is located in exclusive Casa de Campo. A 2 000 unit master planned community. 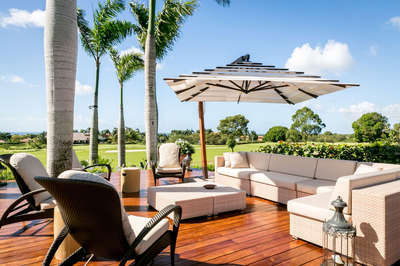 This villa is located in the heart of Casa de Campo, offering guests three championship golf courses, three polo fields, 14 tennis courts, four swimming pools and complete water sport facilities. Culinary choices are extensive in the nine restaurants and seven bars, whether a thatch-roofed bar on stilts or the exotic glamour of Tropicana serving 'Caribbean flair'. On Casa de Campo's elite Minitas Beach, guests can enjoy a variety of water sports including kayaking and windsurfing, or just relax by the water. 500m to the marina and the supermarket. 7.3 km to Minitas Beach. 7.6 km to La Romana Airport. 4.5 km to Dye Fore Golf Course. 5.7 km to Teeth of the Dog Golf Course. 4.5 km to the Links. 4.1 km to Altos de Chavon.